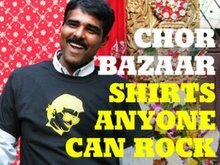 Chor Bazaar is an Indie-Indian Fusion or Desi shop based in Brooklyn, Boston, and D.C. with roots in, India. We design and screen all of our shirts, they are not made by some Internet (cafepress) company outsourced overseas. Our products are hand selected and hand finished, each one is an original. We take great care not to exploit South Asian designs and deter from using kitschy or religious connotations. Because of this, we feel that anyone can rock these shirts without the dismay of the South Asian Community. Our mission is to expand the Desi-fusion art form to another realm. We have experienced the fusion in music and literature but have hardly seen the Desi in urban apparel. Conceptually, we have appropriated from Desi life, past and present, to form graphics that will evoke memories and associations from a lifestyle gone by. Its about creating an identity that stems far beyond how mainstream portrays Desi-ness.